I saw this quote and it made me feel all warm and fuzzy. There really is something truly special about sitting amongst a pile of wrapping paper and tangles of curling ribbon, drawing straws as who should leave to the put the coffee on and contemplating that one of you really should hit the shower some time soon and what time does the turkey need to go in? I think perhaps it’s my very favourite part of Christmas; being in my own home, in my nightdress, with my family beside me. A very close friend of ours passed away a few years ago, having been bravely battling cancer for many years. She went away somewhere fancy one Christmas and when I asked if she’d enjoyed it she said “don’t ever go away for Christmas, all it did was make me realise that the very best thing about Christmas – and what makes it Christmas – is being at home”. 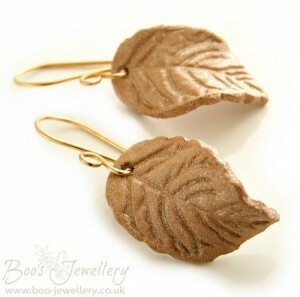 Air dry clay leaf earrings, varnished with a metallic shimmer and hung on bronze earwires. To thank my wonderful customers for their very valued support during 2016, I will be giving away a pair of entirely hand crafted shimmery leaf earrings with bronze earwires on all orders over £18. 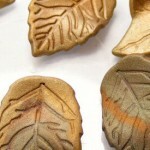 I have individually sculpted the leaves from air dry clay, then sealed with several layers of varnish, with a little metallic shimmer. (This renders them splash proof, but I wouldn’t recommend showering or swimming in them). 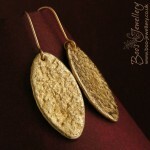 They’re hanging from hand crafted scrolled bronze earwires and are incredibly light and comfortable to wear. 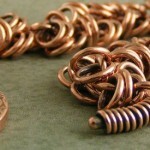 They drop around 35mm (1.4″) and are around 15mm (0.6″) wide. Each leaf has been individually shaped and they’re put together in co-ordinated pairs. They’re all gift wrapped in tiny Christmas pillow boxes ready for giving – or for keeping as a treat for yourself. 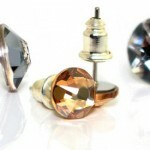 Earrings will be sent whilst stocks last or until the last Christmas postings. I decided recently that, as many technical discussion resources that I previously enjoyed had moved to using the Facebook platform, maybe it was finally time for me to give in and sign up too – having resisted for many years. 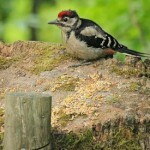 So I now have a Facebook page in my arsenal, so you’re welcome to visit me there too. It does actually have a nice easy interface to make quick posts and add photos etc., so I think I may well use it as a supplement to longer articles posted here on the blog. 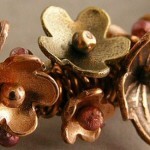 My page is linked to from the top of both the blog pages and my on-line shop. 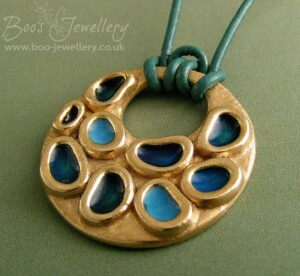 A gold bronze pendant with little softly shaped reservoirs filled with coloured resin. I’ve been thinking lately about adding more colour to pieces. I’ve always fancied enamelling, but other than heat sources, I have no other equipment, so would need to start from scratch. And if I don’t like it, or am not very good at it, that’s wasted expenditure. 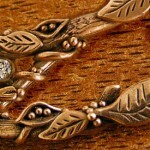 I saw an article recently on UV resin, which sounded very promising. As a trained illustrator, I already have a good assortment of pigments that sounded like they’d be suitable (just a little trial and error would be necessary, to select the best to use) and I already have a UV light source that I use for photopolymer plates, so outlay would be minimal to have a tinker. The long cure time for conventional 2 part resins has put me off before. I did a few tests and selected the best pigments to try and used this piece I made in bronze especially to take colour in the raised cells. It was really enjoyable selecting and mixing colours and curing them under the UV light. They go under the light as a sticky coloured gel, about the consistency of nail polish and come out from under the light, looking exactly the same, glossy and liquid, except now they cell contents are absolutely rock hard. I was quite magical and now I can’t wait to try some more. 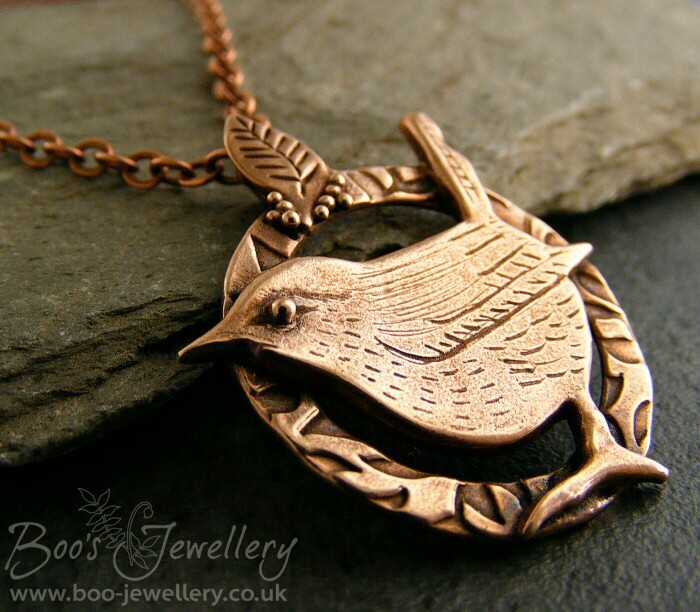 I’m in the process of photographing several new pieces to list in the shop in time for Christmas, but some of the latest pieces are shown in the gallery below and I’ll add to it shortly as I have more photos. 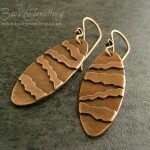 Newest pieces are always shown on the front page of the shop in the Latest Products section – newest at the top. Gold bronze oval earrings with a reticulated texture, polished to a shine on the high spots. 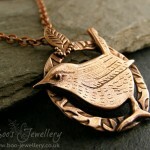 Hand sculpted pink bronze wren pendant with a delicate leaf bail. 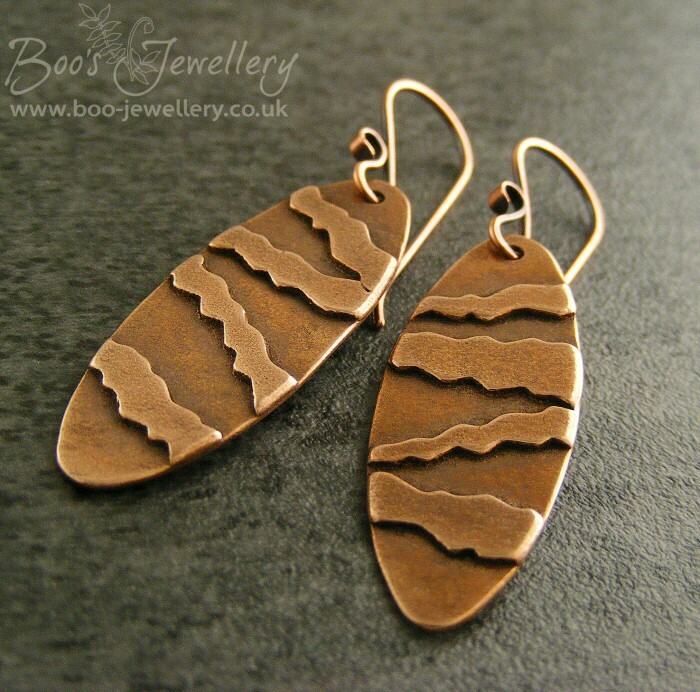 Oval earrings with torn edge appliqued stripes and scrolled hammered earwires. 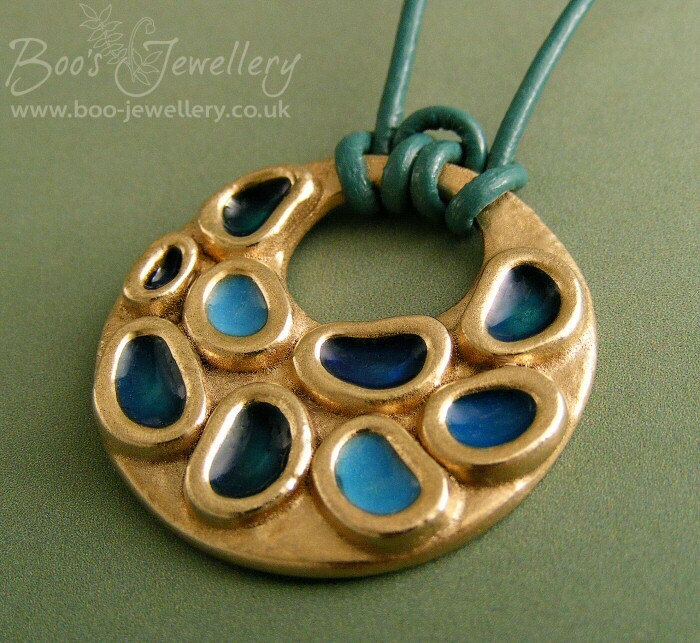 Delicate swirl shaped pendant featuring an appliqued daisy. 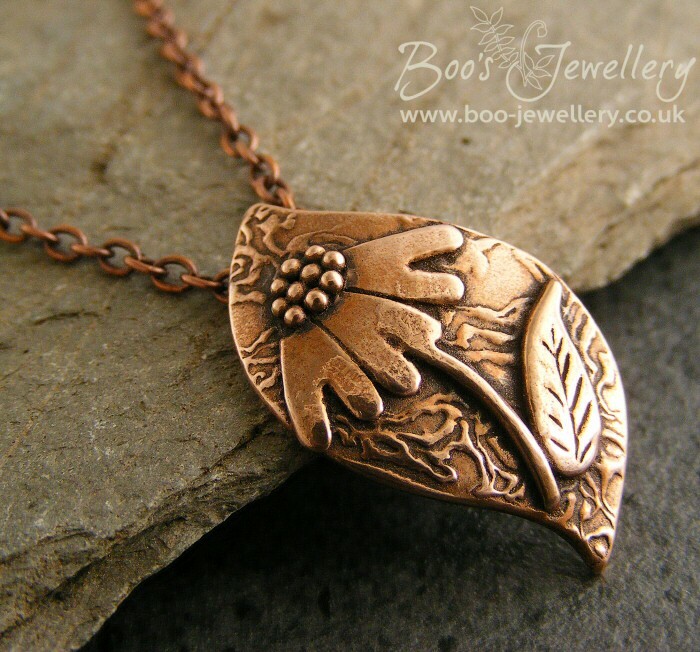 This entry was posted in copper jewellery, finished jewellery pieces and tagged air dry clay earrings, Christmas 2016, Christmas giveaway, Christmas ordering, Leaf earring giveaway, leaf shimmer earrings. Bookmark the permalink.